ON THIS DATE (July 12, 1999) ... The show Mark McGwire put on will be on the enduring list of Fenway lore. McGwire, who forever will be remembered for the record 70 homers he belted last year, socked a record 13 homers in his first at-bat during the home run-hitting contest that is part of Major League Baseball's All-Star jamboree. In the end, it was the Mariners' Ken Griffey who won the Derby and defeating Milwaukee's Jeromy Burnitz, 3-2, in the third and final round. But it was the goateed McGwire, tearing through the ball time and again with his thick, piston-like arms, who will be remembered for his multitude of moonshots, one of which measured 488 feet. In all, those 13 drives in McGwire's first plate appearance traveled slightly more than a mile, an average of 438 feet each. He surpassed the mark of 12 homers hit by Cal Ripken Jr. in the '91 contest. Yet all that is only the math of the amazing feat. More remarkable was the trajectory, the near-surrealistic scope of the drives. One rattled off the top of the light tower in straight-away leftfield. Another, the 13th, soared into the night, just to the left of the light tower in left-center -- a clout that was three-quarters of the way up the stanchion. It was reminiscent of Roy Hobbs stepping up in "The Natural," missing only the broken bulbs. In fact, long after McGwire's explosion in the first round, the ball from one of McGwire's longer blasts was lying on the railroad tracks between the Mass. Turnpike and the parking garage behind the left-field wall. Witnesses said the ball landed on top of the garage and hopped onto the tracks. In Round 2, McGwire muscled only three balls out of the park, preventing him from reaching the finals. It made for an anticlimactic Round 3. The mighty McGwire had to settle for his total 16 homers, equaling Griffey for the high on the night. Griffey also put on an impressive performance, recovering from a first round when he hit only three. The Seattle star has been slowed of late by a troublesome knee, which threatened his participation last night. (He didn't make up his mind until just prior to batting practice.) In Round 2, he came out ripping, after connecting only once with five outs remaining. He then belted nine more, with a handful of drives sent screaming into the bleachers over the bullpens. In the final round, Griffey was pitted head to head with Burnitz, who opened the championship round by hitting two homers. 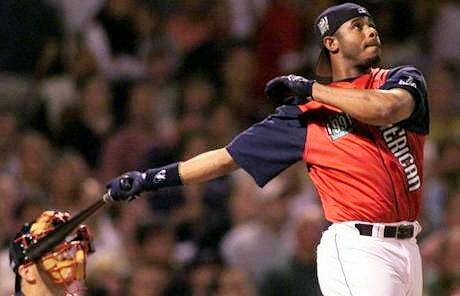 Griffey had to deliver three to win it, and he did so promptly, flipping his black bat into the air when No. 3 went into the bleachers. 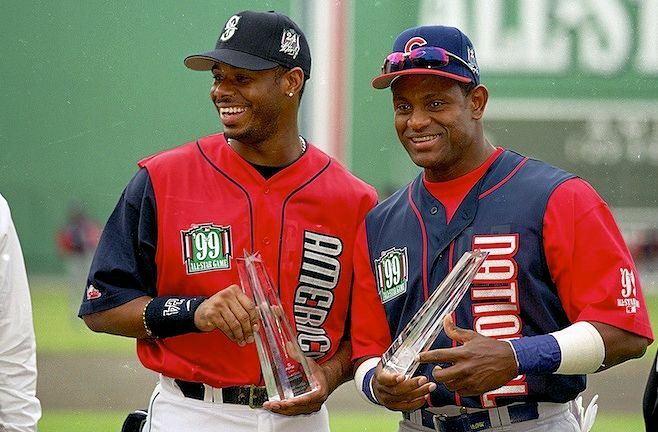 Griffey was the only American Leaguer to make it beyond Round 1. 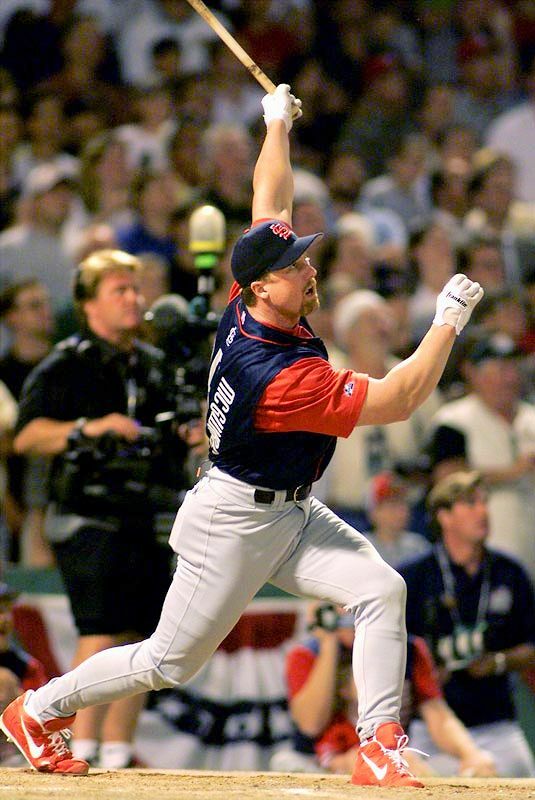 He went up against Boston-born Jeff Bagwell, Burnitz, and McGwire in what amounted to the semifinal round. Burnitz finished with 14 homers, second behind the 16 hit by Griffey and McGwire. In his own way, McGwire provided a headstart tonight, wielding his bat like a wrecking ball. He turned Home Run Derby into big man's tee ball. With the sounds of booming cannons and strains of the 1812 Overture still resonating along the Charles, Big Mac went deep, deeper, and then deeper.